As many of you know we gained to new additions to our household back at Easter, yes we got two now not so small guinea pigs. You can read about their introduction here. They are called Mr Skinny Legs (thank you Peppa Pig) and Shy Guy (thank you Super Mario), they are female however, but don’t seem to have developed any negative effects from their names. 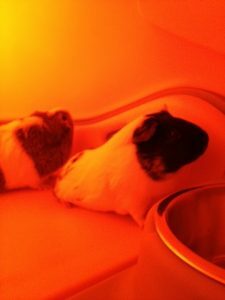 The boys love their guinea pigs, they are so friendly, difficult to catch initially as I think they like the chase, but once you have them cuddled in or in your lap, they are adorable. They also make the cutest noise when you feed them. I think they are fantastic pets for young children, we have never had an issue with biting or scratching and the boys love cuddling them. They are never scared or cower away. They do like to run so beware and they are fast. Cradle them under their legs and they are calm. 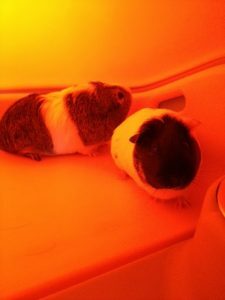 The guinea pigs used to be exclusively indoor pets and were in a boring but large cage. They seemed to like it in there until they were introduced to the magnificent Eglu guinea pig habitat from Omlet. 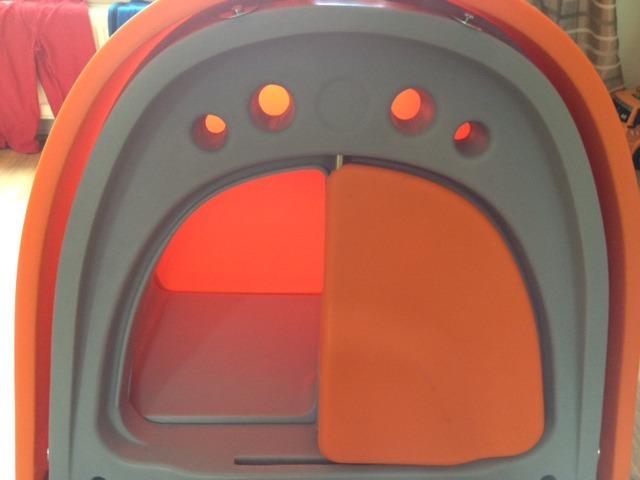 It looks a bit like something from the 70’s or Mork’s space ship from Mork and Mindy. Yes, yes I’m showing my age. However, this is the funkiest and coolest looking guinea pig habitat in the planet. The Eglu Guinea Pig Habitat. How funky does it look? 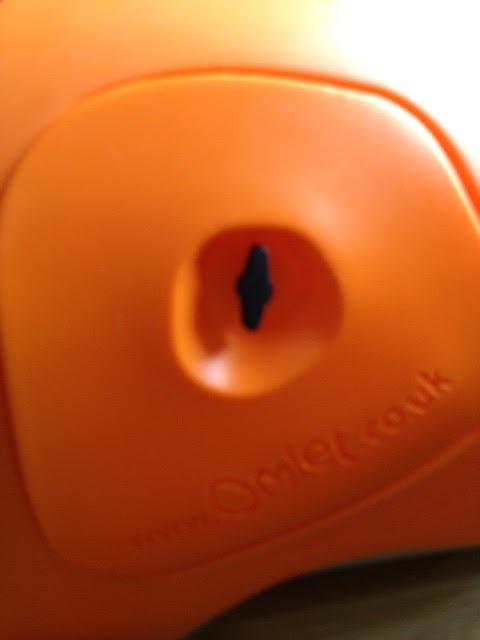 The main section, the Eglu part is made of solid and I mean solid hard wearing plastic. 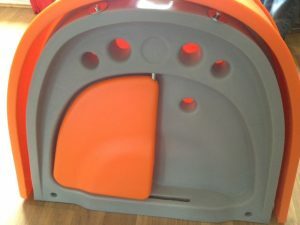 The boys tested this out by driving cars up and down it while I was setting it up. There is a turner at the top of this door,which turns the door from open to closed. This means if you are tidying the pen part you can shut them in or in my case when I was setting it up I shut them in to see how they got on. I think it looks fab, I love the colours and it looks so cosy inside. To change their food and water, close the Eglu door at the front so they are in the pen section. Then go to the side of the Eglu. There is a door at the side of the Eglu with a turning handle which comes off for easy access to change water, hay, food, etc. Key to keep lid on. With the lid off. With the lid off you can easily clean out the house and give it a tidy up. This really is a guinea pig cage which is super easy to clean. Far easier than any other one I’ve come across. 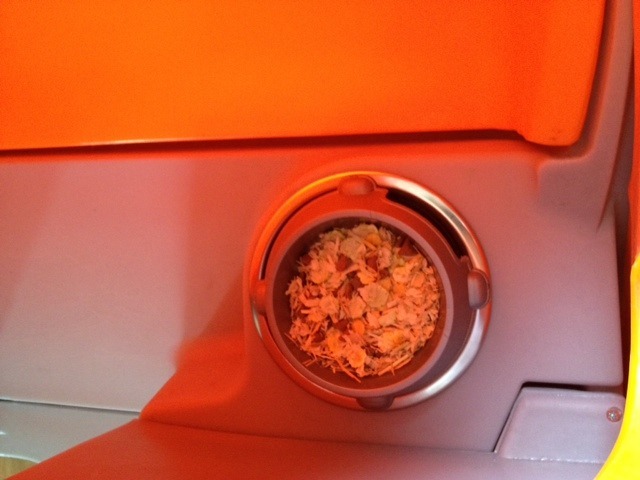 The bedding tray lifts right out for easy clean. We put our Eglu outside as it brightens the place up and with the twin insulated walling and draught free ventilation, the guinea pigs are warm in the winter and cool in the summer. Not that we have much up here in Scotland. The run has a large door at one end for easy entrance to that part and sits flush on the ground to prevent digging. The mesh itself is very strong. Also on the run section there is a very useful shade which prevents the guinea pigs getting soaked and can provide a nice shaded area in the strong sunlight. 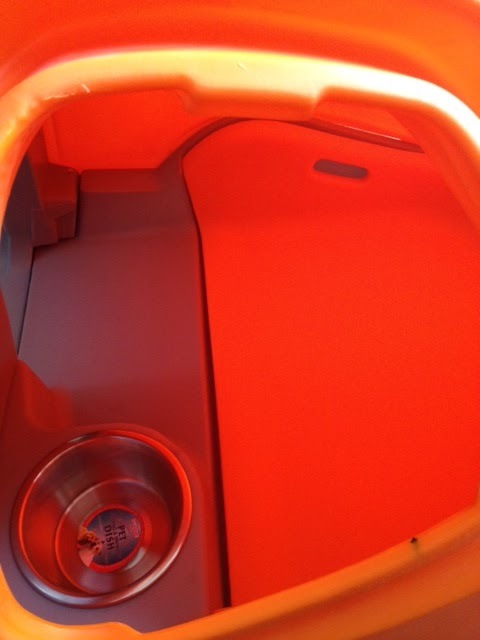 This Eglu can be used for rabbits to but you will need to get the larger run. 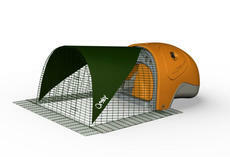 The 1m run size is suitable for 2 to 3 guinea pigs but if you want a lot more you’d be better with the larger run. As you can see from the pictures below, our guinea pigs are settling in nicely and love it. The boys love it too and can’t wait to go out and feed them and play with them. It looks very space age doesn’t it. I would highly recommend Omlet for their funky looking pet habitats. I know the Eglu has proved a big hit in our house. 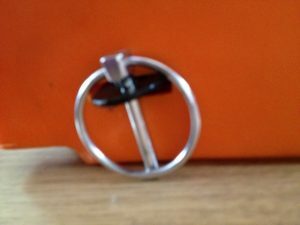 They are very expensive, but they are long lasting and they do look fab.